In this episode of the Proskauer Benefits Brief, partner Neal Schelberg and associate Miriam Dubin discuss cybersecurity issues impacting employee benefit plans. Data breaches are occurring with increased frequency in today’s digital environment. Benefit plans in particular are uniquely susceptible to cyber-risks because they store large amounts of sensitive employee information and share it with multiple third parties. In this episode, we discuss the developing legal framework in the area of cybersecurity and outline practical tips that plan sponsors and record-keepers may use to secure plan data. So be sure to tune in for this very important issue impacting employee benefit plans. Miriam Dubin: Hello, I’m Miriam Dubin. 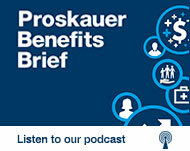 Welcome to the Proskauer Benefits Brief, legal insight on employee benefits and executive compensation. On today’s episode, I’m joined by Neal Schelberg and we are going to discuss cybersecurity issues impacting employee benefit plans. So, Neal, why are benefit plans particularly susceptible to hacks and other cyber-breaches of data? Neal Schelberg: Well there are several reasons. Benefit plans are information rich sources of data that are attractive to hackers. Transponses often share and transmit information electronically to third parties, such as record keepers and other plan providers. Also, many plan sponsors do not maintain sophisticated cyber protections and finally, many plans are in the process of converting from paper to digital data. In connection with healthcare data in particular, the FBI has noted that it is uniquely at risk because information is highly valuable to hackers, who may use it to file false medical claims, obtain prescription drugs and/or steal participant identities, so those are some of the important reasons. Miriam Dubin: What is the likelihood that a plan will suffer a data breach? Neal Schelberg: Well, the ERISA advisory council, that’s a group of benefit experts that are appointed by the Secretary of Labor to advise him and study this issue, and what they said, I think is very relevant. They issued a report in November 2016, and they concluded in that report that it is not a question of if, but a question of when a breach will occur. Today’s digital environment increases the risk of a cyber breach, and the news reports demonstrate that deliberate and inadvertent data breaches occur frequently. Miriam Dubin: Are there any laws affirmatively requiring benefit plans to implement cybersecurity protections? Neal Schelberg: Well actually, there’s no comprehensive federal law that applies, other than for health plans, and that’s HIPPA. Also, it is unclear whether or not plan fiduciaries could be liable for breach of fiduciary duty under ERISA in the event of a cyber breach in a benefit plan. State privacy and other state laws may apply to benefit plans, but there’s always the possibility that ERISA would pre-empt those state laws. Miriam Dubin: So, in the absence of a single legal framework, where should plan sponsors and vendors look for guidance? Neal Schelberg: Well, the ERISA Advisory Council report that I referred to before provides a helpful framework for plan sponsors and service providers to examine and consider cybersecurity issues. Among the recommendations in that report is that plan sponsors establish customized cyber-security strategies, carefully contract with their service providers and implement policies for data protection. For example, data retention, training, reporting, testing and updating processes. Miriam Dubin: So Neal, what are some other strategies plan sponsors may use to protect funding. Neal Schelberg: So here are some tips for securing plan data. Plan sponsors should educate themselves and understand how the plan’s data is stored, accessed and transmitted. They should develop proactive strategies for managing risk and responding to a breach. They should customize these strategies to fit the plans’ practices and data. Third thing they should carefully conduct due diligence on third-party providers and vendors with respect to their cyber-security readiness and review, third-party contractual arrangements to ensure that the plan is protected in the event of a breach. Also, importantly, they should continue to monitor the vendors throughout the relationship. For example, they should ask whether the provider has suffered a cyber data breach and how was it handled? How long did it take the provider to recover the data? They should evaluate the third-party provider’s cyber-preparedness. Fourth, they should think ahead. Back up and segregate data offsite so that the plan is protected in the event of a ransomware attack. They should have a readiness program in place in case a breach does occur, and finally, and importantly, they should consider purchasing cyber liability insurance, both first party and third-party insurance coverage. Miriam Dubin: Neal, can you explain the difference between first-party and third-party insurance coverage? Neal Schelberg: First-party coverage is the coverage that applies for their own data breach. Third-party coverage would apply in the event that there was a breach as a result of data that they sent to a third-party provider or vendor. Miriam Dubin: Well, thank you, Neal, for going through those practical tips. This is obviously a very important issue impacting all employee benefit plans. Thank you for joining us today on the Proskauer Benefits Brief. Stay tuned for more legal insights on employee benefits and executive compensation and be sure to follow us on iTunes.